One of you kind people told me I should "dress like you mean it" when you go for your treatments. Well, let's just say, my glamor days are so OVER. Like about 10 years ago? Also, I do not have exactly the ahem.."foundation" at the moment to properly wear anything drapey or lighter colored than navy blue? This shirt is extremely old and I can see by the photo, that although I pulled it clean out of my drawer, it has seen better days. I cannot part with my Mariners shirt anymore than I could part with my UW Husky socks. Well, friends. What you see is what you get! Comfort all the way! The people at the radiology center are SO NICE. This treatment is very easy so far and they took 3 treatments off my total last week so I only have 3 weeks left. I feel lucky. Today, the woman right before me got her "3 Bells" rung and certificate of completion and I can hardly wait for mine so this can all be behind me. KK and I sewed this week and there will be more posts about sewing soon! I promise! My little KK turned 5 Saturday. She loves her new machine. I made her machine a little cover. We all had a wonderful time at her party. She is getting to be such a big girl. I can't believe it. What a great day! The guys came over, dug up the back yard, added mulch and some other things roses love and planted the last three. I hope they make it. They are a little crowded and the soil is bad so we shall see? There are two more bushes across the lawn at the neighbor's because I just didn't have the room. 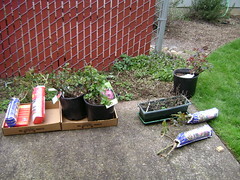 I am keeping my fingers crossed for blooms galore out the door and on my table this summer from these 7 new bushes. This is how it looked when they were done. They also brought me potting soil for my pots. If the weather would cooperate, I would fill those up with Spring flowers asap. Then off to a wonderful meal at Meriwether's over in Portland. The food was fantastic and the view out the window just lovely. No sun, but lots of greenery and beauty..
My bunny girl and boy had fun and true to form, were very well behaved. And, without any planning at all, one DDIL and DD each wore their Jalie shirts that I made them for Christmas. Kewl! It was very comforting to me to have everybody there this year. I am not embarrassed to admit it either. I am doing great and have much to be thankful for and am not complaining at all when I mention that I found out today that I am to have a little radiation. They will tell me the end of the week when I am to start it and how long it will last etc. Just a little insurance policy. 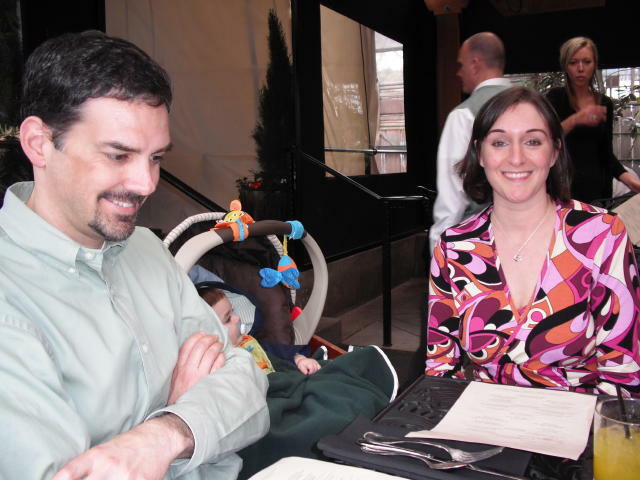 I didn't have the energy to post to my family blog too so posted these pictures here. But, am anxious to start posting about sewing again. Well, at last!! Matilda has been liberated from her box! Yay! Yippee Skippee! Not sure when I will fit the cover but soon. Just a little more healing to do first. I have so much nice fabric to sew some pretty things for Summer and Fall. I totally have the bug...just need a little more mojo. No Fat Lady Singing Here! I did indeed live through my surgery. In fact, due to the superior talents of my surgeon and the wonderful staff at the hospital, I would say I am doing extremely well. There is nothing like a video assisted surgery, with its smaller incisions and less manipulation of your poor little body, to do the trick! My "ahem" problem was removed and further treatment is still up in the air, pending final pathology reports. It is not curable but can be managed for years, if I am lucky. I will be having a few more tests and it is possible I could be in for some additional treatment, if not now, likely down the road a bit. But, all in all, it could have been worse. I mean?? I just had a box delivered from Fabric Mart today that I ordered before I went to the hospital. And, a very sweet friend gave me a gift certificate to order even MORE!! 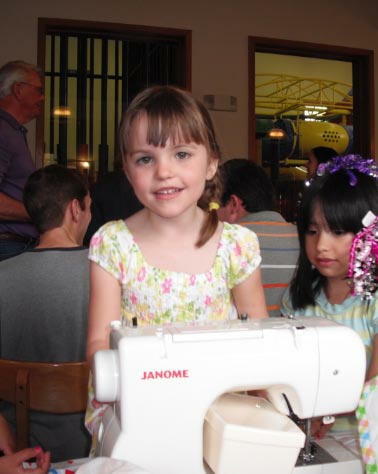 Besides, my KK is getting her new sewing machine for her BD in a couple of weeks. I am so excited to see her face. Thank you to all who asked how I am doing and sent me well wishes. It was very much appreciated during what has been a rather tough time. Hugs to all of you! The Importance of Cheer/Wish Me Luck! Lately, I have noticed how peoples' attitudes effect me. Personally, I like to feel cheerful and to cheer others as well. Many times I will sign off an email with "Cheers" and try to maintain a cheerful attitude. Maybe that is why I love the Christmas season so much? It's all that Christmas cheer?? The Merry part...;-) Sometimes it's hard though. If you are having "issues" to deal with, you can't always be your best, bubbly self. At least, I can't. But, I have noticed what a tonic some people are as I have been grappling with a health issue and a less than stellar health insurance situation. Some people would call it "being positive" but I like the word "cheerful" better. Nothing Pollyanna..I am a total realist. You can be negative around me, as long as you are cheerful about it...hehehehe I had to explain to my 40 year old son what a "crepe hanger" was. He had never heard the expression and that led to a big discussion about how language is passed down from one generation to the next. My children use expressions that I remember my grandparents using....passed down to them from yours truly, no doubt. I remember my grandmother using the term "crepe hanger." One of the cheery things I did today was buy some roses. Three are expensive ones in pots and the other four are bare root. I live in THE rose zone. Across the river in Oregon, the city, Portland, OR is known as the Rose City and their summer celebration is called the Rose Festival. I used to have a rose garden when I lived east of the mountains and it was not easy, let me tell you! The climate was inhospitable for roses and in spite of the cattle guards, a stray steer or two would tromp around there. The deer sampled various plants in my garden too. So, I am thrilled to have a little spot to plant some roses that I can see from my sliding glass door. I do have my favorites, one of which is Tropicana, and I was lucky to find one today. Looks like I have some work to do too. The landlord loaned me a shovel and so far, I have one hole dug....slow...;-) The drainage is terrible and I don't understand how roses a mere 75' from my back door do so well but my little plot of land has really poor soil and doesn't drain. Roses do NOT like wet feet. Un petit problème? 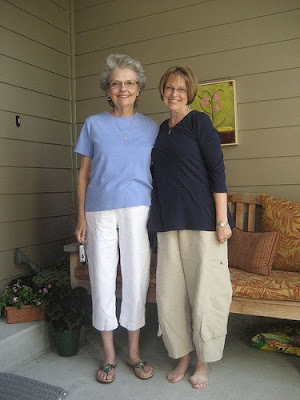 I really wanted this blog to be just about sewing..nothing extraneous. But, life got in the way? I am scheduled for surgery on March 23rd. Please wish me luck. I have a wonderful surgeon who is one of those tonic people and is optimistic that nothing serious will be found. I sniped KK's birthday present from Ebay and think I got a good deal. The person who listed it did it for a friend and I am not sure he realized what he was selling. The price didn't go up til the last minute because of the description. It is a Janome Jem Platinum 760 with all the accessories and extras too. 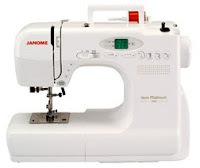 For you non Janome people, it is a ¾ size machine with 60 stitches and very popular for classes as it only weighs about 12-14 pounds. Just right for a little girl to learn on and great for Gabba to take to classes. It will be her machine but will stay here as DD does not sew. Then today, I sniped the Burda WOF May 2004. A sewing buddy was kind enough to loan me hers (check out the multi talented Sham's blog, Communing with Fabric) and it really has some cute patterns for me and also for the girls in the family. I received the eyelet I have been wanting for SO LONG from Gorgeous Fabrics and it did not disappoint. Very delicate though so my blouse pattern has to be just right. Am thinking it over. ;-) Will post photo soon. On a personal note....I have been dealing with a health issue lately and am mentioning since I have been absent from SG and not sewing like I planned. By the end of next week, I hope to be well on my way to feeling like my old (yikes, did I say old?) self. And, thank you....you know who you are.